Put your radio Shack on display! You are proud of your radio shack, aren’t you? 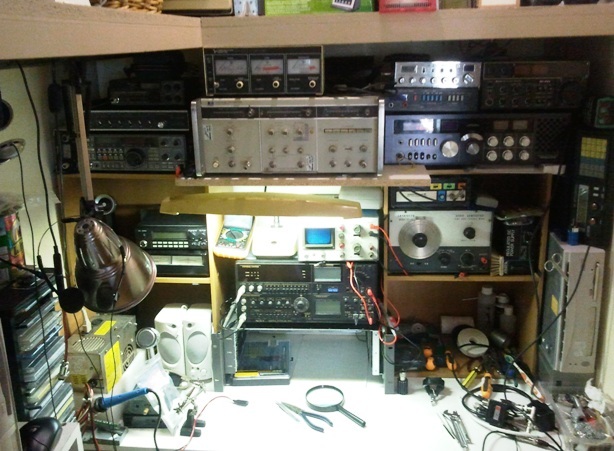 It seems that as the CB & Ham radio user population has thinned out over the last thirty years, the vast number of radio transceivers that existed in the hands of the general population globally have been collected by the die hards. Many operators now still on CB seem to have a disproportionate amount of radios tucked away as spares and some bring them out to use on rotation by the sound of many QSO’s. It would assume many Ham operators are the same as well. And why not? It is a good idea to keep the caps and other components going occasionally to prevent failure from lack of use by all accounts. I have probably near fifty pieces of radio paraphernalia that I have in various places around the property and I am sure there are many more of you that do as well. 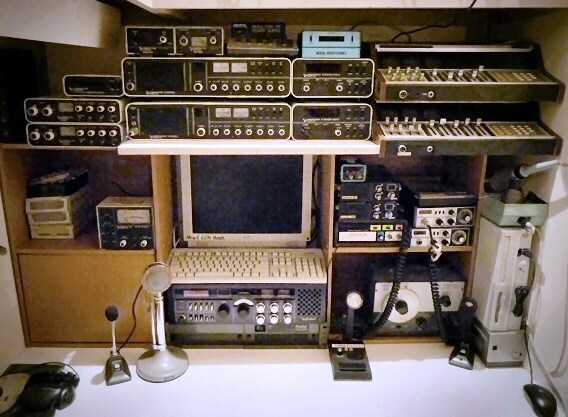 This is a radio shack photo of some of my CB Citizens Band radio gear that I have collected over near forty years. and a good back to base monitored house alarm system as well. The above Citizens Band Radio setup did not last too long though, as it was most of the stuff I had in storage so it was replaced back into secure storage. With it all gone I use the room with all my test equipment to make a workplace for repairs. Test equipment expanded with some B&K CB Radio Test sets so reset everything. 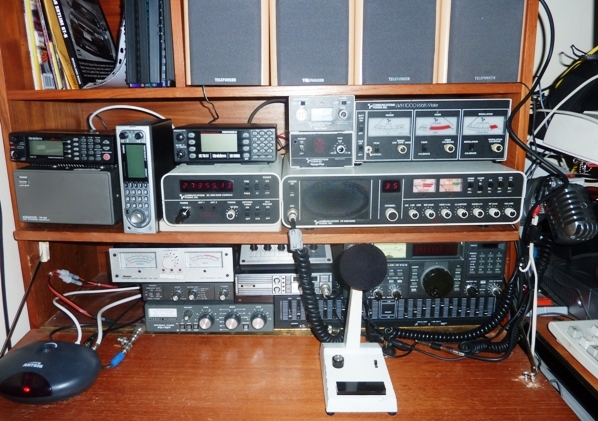 This CB radio shack station below is the main setup I use on a daily basis from my home office while doing computer work so I can keep an ear on all the CB and amateur ham bands and what is happening out there in the local Bellarine Peninsula and Melbourne and Geelong region on my scanners. CPI CP2000 & BC2000 by US Communications Power Incorporated with Turner CPI Microphone. Various Uniden Radio Scanners & ICOM IC R71A Ham Communications Receiver, and Sawtron UHF. Below is my new HiFi CB Radio Audio setup with a Tram D201 CB base station and Behringer and other audio processing units for Transmit and Receive of wider bandwidth 27 MHz 11 metre CB radio audio on SSB. OK I have shown you Mine, now you show me Yours! Create a Radio Operator Listing here and add your stuff! P.S NOTHING is for sale – but if it was it would be on www.AllRadioSales.com website! This entry was posted in CB Radios, CB-Radio-Hobby, Featured CB Radios by 43AX05. Bookmark the permalink.